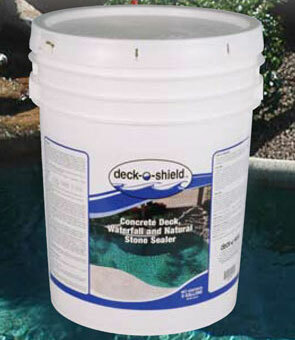 DECK-O-SHIELD is a ready to use, water-based sealer/water repellent for natural stone, concrete, and masonry surfaces. DECK-O-SHIELD is designed for use on waterfalls, as the product will limit the penetration of water into structurally sound, crack-free surfaces. The product can also be used on natural stone decks, walkways, coping stones, or patios. DECK-O-SHIELD is a ready-to-use, water-based sealer/water repellant for natural stone, concrete, and masonry surfaces. DECK-O-SHIELD is designed for use as a sealer/water repellent on waterfalls in or around swimming pools; the product will limit the penetration of water into structurally sound, crack-free surfaces. The product also can be used as a sealer/water repellant for natural stone decks, walkways, or patios; virtually any area located near or around swimming pool areas. Surfaces treated with DECK-O-SHIELD will inhibit the penetration of salts, reducing “whitening” or staining. DECK-O-SHIELD weatherproofs and protects virtually all waterfalls, decks, porches, patios, and walkways around pools, including the following surfaces: natural stone, mortar joint, concrete, brick, concrete block, stucco. Another advantage DECK-O-SHIELD provides is that the product will not alter the color or tint of the surface after application. There is no need for worry when applying DECK-O-SHIELD, because the product will have no adverse effects on surface appearance after application. Breathable – allows moisture in cured concrete to evaporate. DECK-O-SHIELD is not a film-forming material – it penetrates the surface to form an integral barrier to moisture penetration. Surface appearance after application and complete drying is virtually unchanged. Reduces entrapment of dirt particles and other contaminants that cause discoloration; inhibits soiling. Protects against efflorescence and rust staining. Helps resist stains from spills. Protects against salt staining and “whitening” caused by salt in the water. *Always apply a test area to determine actual coverage rates. Coverage rates will vary greatly, due to the porosity of the substrate. **Due to porosity, certain stone and block applications may require a significant increase in coverage rates – additional applications may be necessary. When stored indoors and in original, unopened containers at temperatures between 40 – 90° F (4 – 32° C), shelf life is a minimum of two years from date of manufacture. Complies with all current federal, state, and local maximum allowable VOC requirements, including U.S. EPA, LADCO, SCAQMD, and OTC. Surface Preparation … Protect people, vehicles, property, plants, and all non-masonry surfaces from product, splash, residue, and wind drift. Thoroughly clean the surface. Though DECK-O-SHIELD may be applied to slightly damp surfaces, best performance is achieved on a clean, thoroughly dried and absorbent surface. Excessive moisture inhibits penetration, reducing the service life and performance of the treatment. Always test for compatibility. Surfaces must be structurally sound, clean, and free from dirt, efflorescence, and stains. Surface and Air Temperatures … Optimum surface and air temperature is 40° – 95° F (4° – 35° C) during application and eight hours after. If freezing conditions exist before application, let surface to receive treatment thaw. The DECK-O-SHIELD water carrier may freeze at low temperatures or evaporate at high temperatures. Both conditions impair penetration and results. Equipment … Apply with brush, roller, or low-pressure spray (<50 psi), depending on surface texture, area, etc. Fan tips are recommended for sprayers. A Chapin 1949 sprayer with 1-5915 nozzle is recommended. Test Application … Always perform a test application on each type of surface prior to full-scale application to determine suitability and final appearance. Test using the recommended application instructions. Let area dry thoroughly before inspection. Vertical Application Instructions … For best results, apply to a visibly dry and absorbent surface. Spray … Saturate from the bottom up, creating a 4″ – 8″ (10 – 20 cm) rundown below the spray contact point. Let the first application penetrate for 5 – 10 minutes. Re-saturate while surface still appears moist. Less product will be needed for the second application. Brush or Roller … Saturate uniformly. Let penetrate for 5 – 10 minutes. Brush out heavy runs and drips that do not penetrate. Dense Surface Application Instructions … Apply a single coat. Use enough to completely wet the surface without producing drips, puddles or rundown. DO NOT OVERAPPLY. Horizontal Application Instructions … Saturate in a single application. Use enough to keep surface wet for 2 – 3 minutes before penetration. Broom out any puddles or drips until they soak in. Note: Hot, windy conditions will evaporate the water carrier, reducing penetration and performance. On hot, windy days, apply early in the day and in shade, if possible. Treated surfaces dry to touch in 1 – 2 hours. Protect surfaces from rainfall for six hours following treatment. Many surfaces need several days to develop optimum water repellency. Additional Coats … Once the surface being treated has received the optimum amount of DECK-O-SHIELD, any additional coats will bead up on the surface. Discontinue application once this occurs. The CS-309™, EXPO-GLOSS®, DECRA-SEAL™, TIAH® and VOCOMP® series of products from W. R. MEADOWS can be applied over a surface treated with DECK-O-SHIELD. The resulting barrier will provide water beading and, depending on product used, will also provide a glossy surface appearance. The initial application of DECK-O-SHIELD must be applied properly and at recommended application rate. Cleanup … Immediately clean tools, equipment and overspray with soap and warm water. DO NOT DILUTE OR ALTER. MIX THOROUGHLY PRIOR TO USE. DO NOT FREEZE. DECK-O-SHIELD is a water repellent, not a waterproofing or vapor barrier. It will not hide existing surface stains. DECK-O-SHIELD should not be applied to surfaces that are to receive caulks or sealants. Application over fully cured elastomeric sealants typically will not affect the sealant. Do not apply to surfaces with temperatures of <40° F (<4.4° C) or >95° F (>35° C). Prevent from being spilled or over sprayed onto nearby water sources. Temporary darkening of some substrates may occur. Apply a small test patch application prior to full-scale application. Refer to Material Safety Data Sheet for complete health and safety information. “DECK-O-SEAL®, A Division of W. R. MEADOWS, INC., warrants at the time and place we make shipment, our material will be of good quality and will conform with our published specifications in force on the date of acceptance of the order.” Read complete warranty. Copy furnished upon request. The information contained herein is included for illustrative purposes only, and to the best of our knowledge, is accurate and reliable. DECK-O-SEAL cannot however under any circumstances make any guarantee of results or assume any obligation or liability in connection with the use of this information. As DECK-O-SEAL has no control over the use to which others may put its product, it is recommended that the products be tested to determine if suitable for specific application and/or our information is valid in a particular circumstance. Responsibility remains with the architect or engineer, contractor and owner for the design, application and proper installation of each product. Specifier and user shall determine the suitability of products for specific application and assume all responsibilities in connection therewith.